You are here: Home / Brand and Identity / Can destinations reconcile competing logos and brands? Changing a logo is like a divorce. It can be messy, painful and take years to complete. It’s no wonder that some of the most successful destination logos (like those of New York, Paris, Berlin and Spain) have been left untouched for decades – because fundamentally, a whole community must feel ownership of the destination’s (or place’s) brand and its logo in order to be successful, and consistency and continuity are key ingredients of recognition and awareness. A logo is only a tiny piece of a destination’s brand, but since it also seeks to connect with travellers, changes will be strongly felt by everyone. But what happens when communities or stakeholders are at odds? This points out a challenge faced by many destination marketing organizations (DMOs) – their destinations have many competing brands. Cities, regions, nations and local associations all tend to have their own visual identities and branding language. If your destination needs to lead the parade under a clear and unambiguous banner, can you afford to have more than one logo? Thankfully, building in collaboration amid competing priorities (and potential conflict) is the DMO’s daily business. Here are two ways to go advance your cause amid any potential conflicts around the logo changes. This is quite rare in destination marketing, and for good reason: politics. 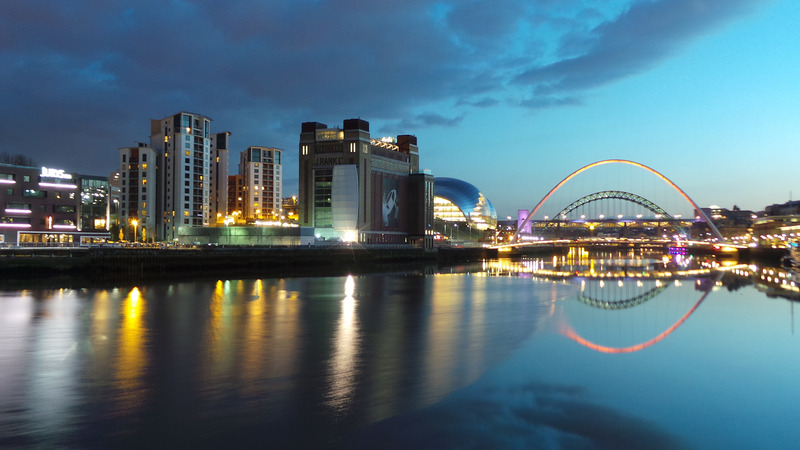 However, brand mergers do happen, and north-eastern England’s NewcastleGateshead is a good example. Their logo image is simple and expresses exactly what it needs to: that two English communities, Newcastle upon Tyne and Gateshead, decided to join forces. The image of the Gateshead Millennium Bridge over the River Tyne symbolizes this union. Merging two logos requires a thorough process, during which it’s extremely important that the option of creating a visually distinct logo instead always stays on the table. Mergers are common in the financial world, in the airline industry and elsewhere, but they are very expensive and they take time. In order to be successful, destinations need to communicate and promote the merger in order to gain acceptance from stakeholders, and more importantly from residents and visitors. So how could this merging process begin? First, identify the synergies between the two existing brands (e.g., between one city and another, or between a city and a region). Define how each brand creates real value for customers. The question of value is likely going to be the most difficult to define, because everyone will take it for granted that their brand is valuable. But you’ll need to identify clearly what exactly each brand brings to the equation? Then, create a transition plan for the merger that outlines exactly what role each former brand will play, and how each will deliver that value. Commission a logo design that combines graphical elements of both existing logos, one that suits all parties involved. Finally, once it is ready, communicate, communicate, communicate that this new logo represents your destination. Brand architecture is about building tailor-made branding. For destinations, this is typically the better and stronger of the two options (i.e. to merge or not to merge? That is the question.) It means deciding which brand will be the most appropriate to your target markets, and in which context. This focus helps avoid the visual pollution (and the messy layers of brand lasagna) caused by layering logo upon logo. Belgium offers a very good example as a compact destination in a highly competitive European market. Unusually, Belgium has no national destination marketing organization (DMO). The northern region of the country is called Flanders, which promotes itself internationally in 11 markets. Visit Flanders does promote its region through a focus on product development, but it must stay behind other brands if wants to reach markets like the USA, Germany and France (where “Belgium” is promoted), the UK (where travellers see “Flanders Fields” or “Bruges”), or China and India (where “Europe” is the important brand). Flanders itself only leaps to the front if a market requires it, as in the case of The Netherlands or Italy, where Flanders is the strongest. Under this architecture, a region like Flanders is a place of many brands, not a branded place. Even Flemish nationalists will understand that investing in a regional brand against all economic and financial logic is like carrying coal to Newcastle – difficult and ultimately futile. Look to Stratford, Ontario, Canada for another strong example of brand architecture in action, where regional DMO, Regional Tourism Organization Four (RTO4) in Ontario decided to invest in its local cities and towns, such as the community of Stratford and its experiences, instead of branding the region. So, can you really afford to have more than one logo for your destination, knowing that you’ll risk confusing your target markets? The answer is no. You only have one shot at reaching your audience, and anything that misses the mark is a waste of money. But we all know that destination marketers work in a complex, multi-stakeholder environment and that it’s sometimes necessary to include all the logos somewhere on the message. Since merging brands – a very elegant way of showing how people can work together in your destination – will be often a bridge too far, the key is to support the process with good insight into the ecosystem of your destination’s brands. Set up a brand architecture that defines what will work best for market X or Y and what will create the most value for them. And finally a tip: don’t assume that you are a mono-destination that should be known to every market. Instead, define what your message is and when it should come to the forefront. Have the courage to make decisions and leave out the brands that do not ring true to your target markets. Are you developing your brand strategy? Destination Think! has helped many destinations as a unique partner through workshops and consultation. To learn how to identify your destination’s DNA and refine your destination’s brand, contact us today. I am the owner for the past 9 years of a unique destination & vacation house rental property in the middle of the ‘rust belt’. It is an area of SW Pennsylvania that has been ignored by politicians for decades, and with the exodus of the steel making industry here south of Pittsburgh and in particular our Mid Mon Valley region our small towns and its residents have taken a hit. Not to mention the fact that we are at the end of 4 counties and therefore have been treated as stepchildren by our local politicians as the decay continues and their pockets are lined by sending all the resources to the county seats — instead of these out lying, once beautiful small towns. We have a 15 mile radius with a population of 200,000 people and 4 small chambers of commerce with no vision or plan to attract anything to the region — except absentee “slum” landlords who are scooping up real estate for practically pennies and allowing them to turn into dumps & havens for drug addicts to hide. I think it is time to combine all the chambers creating one vision and a new brand instead of the old stigma attached to the Mid Mon Valley (old steel mills, coal mines, etc) to the Mon River Valley region which embraces a beautiful asset that we all share being along the Monongahela River. Any suggestions on how I can go about this? My vacation house rental property is called “The Good OL’ Days House” and is a museum type vacation house rental that has been bringing guests in from all over the United States and Canada for unique trips down memory lane — along a beautiful main street filled with boutiques, restaurants, an elementary school, churches, taverns, bakery, just like an old Norman Rockwell painting. I can’t say the same for many of the adjoining towns — but the potential for them is there — but no leadershp, vision or plan. Thank your for taking the time to read this and I hope you can share with me any advice.